Here are tonight's EVOLVE 102 results from New Orleans. A wild match here where the only way the tag titles would change hands is if the champions took the fall. Catch Point imploded when Williams wouldn't allow Garrini to lay down for the champions after Hathaway directed him to. The End defeated The Workhorsemen with the Hell on Earth to finish off this one. Lee absolutely demolished Allin, but he would not give up or stay down. Huge powerbomb and the Ground Zero finally scored the pin. Post match, Lee accepted the challenge of Theory for tomorrow. Darby was then attacked by Jarek 120 to send a message. Physical match with everyone showing their strength and fighting spirit. The big men WALTER and Sekimoto traded everything they have in the center of the ring and rope running, Sawa used his incredible hand and foot speed to work over Thatcher before they had a slugfest of their own. The finish saw WALTER holding back Sekimoto while Thatcher choked out Sawa. Post match the crowd gave a standing ovation as all four men showed each other respect for the battle they went through. Stokely Hathaway then made his way from behind the curtain to offer Thatcher a chance to bow out of the tag team championship match tomorrow, Darby Allin then took the mic and offered to fight WALTER right now, he was destroyed and left laying as Ringkampf left. Well paced match early on with Sabre having a counter for everything in Riddle’s playbook, a technical masterpiece by Zack before the strikes and power moves came in to play. Riddle hit various knee strikes and his Gotch Style Brostone for near falls before locking in the Bromission to become the new EVOLVE champion. 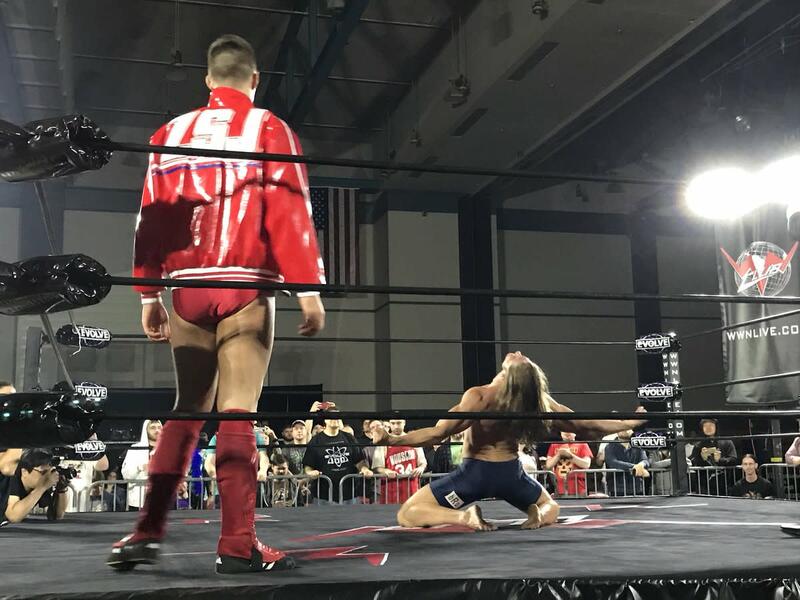 Sabre Jr. handed him the title in a show of respect as the crowd showed their appreciation for the match and the show. The two fist bumped to close out the show.